My sister doesn't read this journal, so it's safe for me to talk about this here. So, her birthday is the 27th of November. This means every year, I'm buying her birthday and Christmas gifts very close together. Sometimes it's harder than others to know what to get. But this year, she actually sent me a list. She wanted a good set of make up brushes. Now, as I'm sure most of you know, good make up brushes are not cheap, generally speaking. Still, she is currently using a hodgepodge of brushes, a couple from MAC, a couple old Mary Kay brushes, a couple other random no name ones she's picked up over the years. She wants a set. So, as with most things make up related, I went to Sephora for help. I used to have no idea what Sephora was. My first exposure came a few years ago, when I was visiting some friends in Seattle and we were in the downtown mall. I fell in love. There isn't a store near me, so whenever I'm anywhere near one - Seattle, Disneyland, Vegas - I invariably end up spending more money than I intend to when I walk in. It's almost impossible not to - there's always some kit, some new eyeshadow, concealer, lip color, etc, that I can't resist. I avoid browsing them online, usually, because, well...it's dangerous for the pocketbook. And half the fun of the store is getting to try before you buy. But in this instance, I had little choice. There's no chance I'm getting to an actual, physical store before her birthday. Well, 20% off will make my sis's b-day gift a little more affordable! Oh, and I really need a new mascara, and I've been meaning to look at foundations since I haven't found a new one to fall in love with since Dr. Oz told everyone how potentially dangerous my beloved Bare Minerals might actually be....you see how this goes. But that's not the half of it. Because when I clicked that link, to what did my wondering eyes appear? Sephora has a special holiday palette, too, but it's SO huge, I don't think I could ever use them all, nor would I want to. This, on the other hand, is just big enough to be REALLY SPARKLY for only $56 w/an extra 20% off (dropping it to $44), for supposedly over $600 in product. Now, I've read a few reviews, and apparently the eyeshadows alone by volume are worth over $300 if purchased separately and at half price (as they are exactly half the usual amount) from the LORAC shelf at Sephora. So, I'm inclined to believe the $600 number. Also, unlike a lot of huge palettes that end up being manufactured in places like China to save the cosmetic companies enough money to offer them at these deals, this one apparently says it was put together here in the US. The upshot is, 36 shades of eye shadow in both matte and shimmer, nine lip colors, three blush and one bronzer, for $44? Even if I only use half those colors, it's SO worth it from a company like LORAC. I've been making due with my admittedly awesome Urban Decay Deluxe Shadow Box for some time, and I think it cost me $38 at the time. So, what the heck. I bit the bullet. I bought my sister her brush set for her birthday (Sephora's deluxe antibacterial set), and one of these sets for her for Christmas. Meanwhile, I splurged and got one for myself, as well. I also bought a pressed mineral foundation from Sephora. We'll see how I like it. I don't wear eye shadow, but if LORAC's is anywhere near as good as their Oil-Free Wet/Dry Powder Makeup (which I can't live without), that's a hell of a bargain. 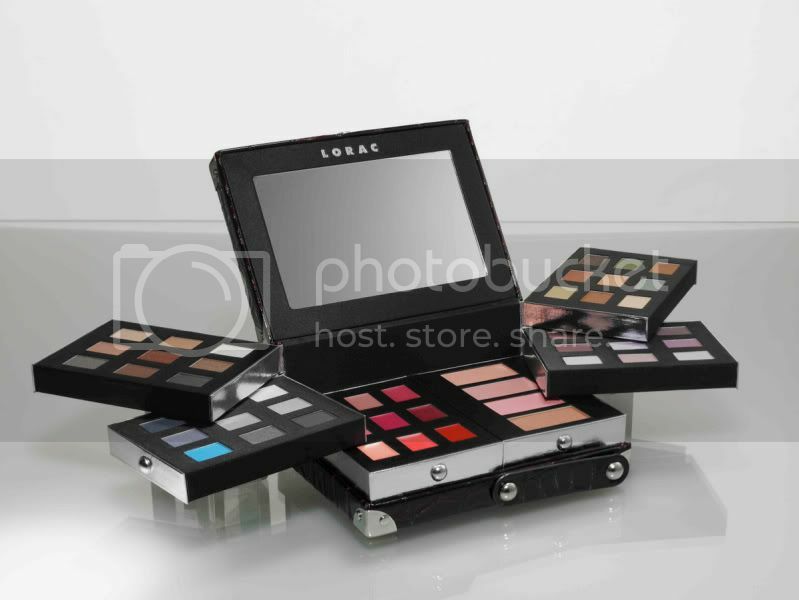 LORAC has good stuff - very nice!